Further to our recent post on using the DS3231 RTC module in situations where extremely accurate long duration timing is required, here is an example of a project we recently completed using this same module. A Slave Clock is a clock which depends for its accuracy on another clock – the Master Clock. Our client has a Mercer UK slave clock which requires a 12V pulse once every 30 seconds for it to run accurately. He wanted an accuracy better than +/- a few seconds per week. As the DS3231 is accurate to better than 2ppm (parts per million), it will gain or lose no more than one second every six or so days. 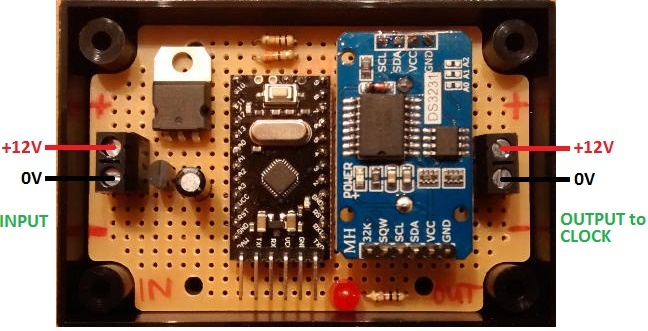 Pictured above is the unit we put together coupling a DS3231 module with an Arduino Pro Mini (clone) for the master clock. 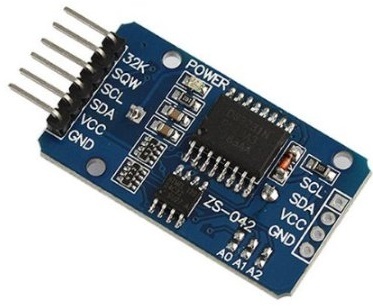 The Arduino constantly monitors the time from the DS3231, and each time the number of seconds in the time is 00 or 30, a half-second long 12V pulse is output to the slave clock. Pictured below is one of master clocks fitted into the back of Standard Electric Time Company secondary (or slave) clock. It is a double faced clock which is destined to hang in a small museum. If you need any kind of accurate timer, please email neil@reuk.co.uk with details of your requirements.